The Company currently has its internal rules and regulations, within the framework of various laws, which govern the conduct of all permanent employees of the Company. This code shall be applicable to all the Board Members and Senior Management of the Company and the principles prescribed in this Code are general in nature and lay down broad standards of compliance and ethics, as required by Clause 52 of the Listing Agreement with the SME Platform of Bombay Stock Exchange Limited (BSE). Violations of law, or this code or company’s rules & regulations or procedures should be reported immediately to the Chairman/Compliance Officer of the company in writing. wherever used in this Code, shall have the meaning assigned to them. ‘Company’ means R J Bio-tech Limited. ‘Board Members’ means Board of directors of the Company. ‘Senior Management’ shall mean personnel of the company who are members of its core management team excluding Board of directors. Normally, this would comprise all members of management one level below the executive directors, including all functional heads. ‘Relative’ shall have the same meaning assigned to them in Section 2(41) of the Companies Act, 1956. ‘Price Sensitive Information’ shall have the same meaning as assigned to them in SEBI (Prohibition of Insider Trading) Regulations, 1992. ‘Officers’ shall collectively refer to the board members and the senior management personnel. COMPLIANCE All Board Members and senior management personnel of the Company shall affirm compliance with this Code on annual basis in such form as may be prescribed (Annexure I) and send it to the Compliance Officer by 30th April. Shall not commit any offence involving moral turpitude. Shall refer all inquiries or calls from the press, media and financial analysts to the Company’s Chairman. The Company has designated its Chairman as official Company spoke people for any company related matters. Unless specifically permitted by the Chairman of the Company, not to hold any positions or jobs or directorship or engage in other businesses or interests that are prejudicial to the interests of the company. Shall not disclose any Price Sensitive Information/Unpublished Price Sensitive information that may affect performance of the Company. Unless specifically permitted by the Chairman of the Company, the Officers shall not serve as director of any other company or accept any appointment or post, whether advisory or administrative or as partner of a firm that is engaged in a business competing with the Company or with which the company has business relations. The Officers shall protect the Company’s assets including physical assets, intangible assets, information and intellectual rights and shall not use the same for personal gain. All the members of the Board and senior management personnel of the company shall ensure that their actions in the conduct of business are totally transparent except where the needs of business security dictate otherwise. Such transparency shall be brought about through appropriate policies, systems and processes. All the members of the Board and senior management personnel of the company should strive for optimum utilization of available resources. They shall exercise care to ensure that costs are reasonable and there is no wastage. All the members of the Board and senior management personnel of the company shall follow all prescribed safety and environment related norms. AMENDMENT TO THE CODE The provisions of this Code can be amended and modified by the Board of directors of the Company from time to time and all such amendments and modifications shall take effect from the date stated therein. PLACEMENT OF THE CODE ON WEBSITE Pursuant to Clause 52 of the listing Agreement, this Code and any amendment thereto shall be posted on the website of the Company. This Code has been framed in pursuance to the regulation contained in sub-regulation (1) of Regulation 8 of SEBI (Prohibition of Insider Trading) Regulation, 2015 and the purpose of this code is to ensure timely and adequate disclosure of Unpublished Price Sensitive Information. These Regulations will be applicable from 8th June, 2015. R J Bio-tech Limited has formulated this Code called ‘R J Bio-tech Limited’s Code of Practices and Procedures for Fair Disclosures of Unpublished Price Sensitive Information’ to ensure timely and adequate disclosure of unpublished price sensitive information which would impact the price of the company’s securities and to maintain the uniformity, transparency and fairness in dealing with all stakeholders and in ensuring adherence to applicable laws and regulations. Further, the Company endeavours to preserve the confidentiality of un-published price sensitive information and to prevent misuse of such information. ‘Compliance Officer’ for the purpose of these regulations means the Company Secretary of the Company. In absence of the Company Secretary the Board of Directors may authorize such other officer of the Company to discharge the duties of Compliance Officer under the regulations. ‘Chief Investors Relations Officer’ means Compliance Officer of the Company. material events in accordance with the listing agreement. Unpublished Price Sensitive Information shall be given to the Stock Exchanges and disseminated promptly on a continuous basis. The disclosure of unpublished price sensitive information shall be on a continuous, immediate, uniform basis and will be universally disseminated. The company may consider other ways of supplementing information released to stock exchanges by improving Investor access to their public announcements. overseeing & co-ordinating disclosure of Unpublished Price Sensitive Information to stock exchanges, analysts, shareholders and media. Information disclosure/dissemination may normally be approved by the Compliance Officer. If information is accidently disclosed without the prior approval of Compliance Officer, the person responsible shall inform the Compliance Officer immediately. Prompt disclosure/dissemination of information may be done through various media so as to achieve maximum reach and quick dissemination. The Company shall ensure that disclosure to stock exchanges is made promptly. Replies to all queries or requests for verification of market rumours shall be sent only after obtaining the approval of the Chairman or the Managing Director. 5.2 Such replies shall be signed by the Compliance Officer. In his absence, such replies shall be signed by such other officer/ person as may have been authorized. 5.3 The Compliance Officer shall oversee corporate disclosure. He shall be responsible for deciding whether a public announcement is necessary for verifying or denying rumours and then making the disclosure. The Company should follow the guidelines given hereunder while dealing with Analysts and research personnel. Only Public information is to be provided to such Analysts/Research person and Institutional Investors or any information given to Analysts/Research Person should be simultaneously made public at the earliest. In order to avoid mis-quoting or mis-representing it is desired that two Company representatives be present at the meeting with Analysts and Institutional Investors and the discussion should preferably be recorded. notice and a considered response should be furnished later. If the answer includes price sensitive information, a public announcement should be made before responding. Unpublished Price Sensitive Information shall be handled on a “need to know” basis i.e. unpublished Price Sensitive Information shall be disclosed only to those where such communication is in furtherance of legitimate purposes, performance of duties or discharge of legal obligations. The Company shall disseminate all Price Sensitive Information on a continuous and in a timely manner to stock exchanges where its Securities are listed and thereafter to the press. disclosure of Price Sensitive Information so as to improve investor access to the same. 7.4 The information filed by the Company with the Stock Exchanges under the Listing Agreement may also be posted on the Company’s website. The Compliance Officer shall be responsible for ensuring that disclosures of shareholdings/ ownership of major shareholders and disclosure of changes in ownership as required under the Stock Exchange Listing Agreements and/or any rules/regulations made under the Securities & Exchange Board of India Act, 1992 are made in a timely and adequate manner. 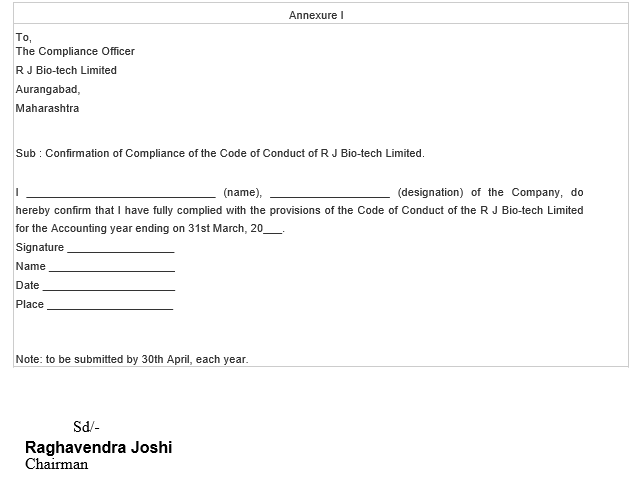 The Board of Directors of R J Bio-Tech Limited (“the Company”) constituted the “Nomination and Remuneration Committee” at the Meeting held on May 5, 2014 with immediate effect, consisting of three (3) Non-Executive Independent Directors. To guide the Board in relation to appointment and removal of Directors, Key Managerial Personnel and other employees. To evaluate the performance of the members of the Board and provide necessary report to the Board for further evaluation of the Board. To recommend to the Board on Remuneration payable to the Directors, Key Managerial Personnel and other employees. To provide to Key Managerial Personnel and other employees reward linked directly to their effort, performance, dedication and achievement relating to the Company’s operations. To retain, motivate and promote talent and to ensure long term sustainability of talented managerial persons and create competitive advantage. Act means the Companies Act, 2013 and Rules framed thereunder, as amended from time to time. Board means Board of Directors of the Company. Directors mean Directors of the Company. Such other Employees as may be prescribed. The roles and responsibilities of the Committee. Evaluating, reviewing and recommending to the Board the remuneration of the Executive Directors, striking a balance between the performance and achievement. Assess the current Board’s skills, experience and expertise to identify the skills that would best increase Board effectiveness. Develop selection criteria for potential board candidate(s). Informal discussion by the Board to generate a list of potential candidates who may fill the stated criteria. Where considered necessary, use the services of an independent executive search firm to assess the appropriateness of potential candidates or to supplement a candidate list provided by directors. Measure the final potential candidate(s) against the selection criteria. The Board examines the final list of candidate(s) and agrees an order of preference. Candidate is appointed to the Board. Non-executive directors should be appointed for specific terms. The remuneration to be paid to Executive Directors of the Company is to be approved by the Board of Directors on the recommendations of the Nomination and Remuneration Committee. The Company’s remuneration strategy is market-driven and aims at attracting and retaining high calibre talent. The strategy is in consonance with the existing industry practice and is directed towards rewarding performance, based on review of achievements, on a periodical basis. Besides sitting fees, the Non-Executive Directors are also entitled to commission out of the profits of the Company, at a rate not exceeding 1% of the net profits per annum of the Company, calculated in accordance with the provisions of Sections 196, 197 and 198 of the Companies Act, 2013, as approved by the Board and within the overall limits prescribed by the Companies Act, 2013. Remuneration of the Executive Directors consists of a fixed component and a variable performance incentive. The Nomination and Remuneration Committee makes annual appraisal of the performance of the Executive Directors based on a detailed performance evaluation, and recommends the compensation payable to them, within the parameters approved by the shareholders, to the Board for their approval. Remuneration Policy relating to remuneration of Directors, Key Managerial Personnel and other employees. Framework for evaluation of the Board, its Committees and individual Board Members including Independent Directors. Policy on appointment of Board Members. The Committee shall consist of a minimum 3 non-executive directors, majority of them being independent. Membership of the Committee shall be disclosed in the Annual Report. Chairperson of the Committee shall be an Independent Director. Chairperson of the Company may be appointed as a member of the Committee but shall not be a Chairman of the Committee. In the absence of the Chairperson, the members of the Committee present at the meeting shall choose one amongst them to act as Chairperson. Chairman of the Nomination and Remuneration Committee meeting could be present at the Annual General Meeting or may nominate some other member to answer the shareholders’ queries. A member of the Committee is not entitled to be present when his or her own remuneration is discussed at a meeting or when his or her performance is being evaluated. The Committee may invite such executives, as it considers appropriate, to be present at the meetings of the Committee. Matters arising for determination at Committee meetings shall be decided by a majority of votes of Members present and voting and any such decision shall for all purposes be deemed a decision of the Committee. In the case of equality of votes, the Chairman of the meeting will have a casting vote. Proceedings of all meetings must be minuted and signed by the Chairman of the Committee at the subsequent meeting. Minutes of the Committee meetings will be tabled at the subsequent Board and Committee meeting. The R J BIO-TECH LIMITED is an equal employment opportunity company and is committed to creating a healthy working environment that enables employees to work without fear of prejudice, gender bias and sexual harassment. It is committed to provide a work environment that ensures every employee, irrespective of their gender is treated with dignity and respect and afforded equal treatment. The Supreme Court has also directed companies to lay down guidelines and a forum for Redressal of grievances related to sexual harassment. This Policy extends to all employees of the Company and is deemed to be incorporated in the service conditions of all employees and comes into effect immediately. vi) any unwelcome gesture by an employee having sexual overtones. 2.3 “Employee” means any person on the rolls of the Company including those on deputation, contract, temporary, part time or working as consultants. 3.2 A quorum of 2 members is required to be present for the proceedings to take place. The quorum shall include the Chairperson, at least two members, one of whom shall be a lady. Any employee who feels and is being sexually harassed directly or indirectly may submit a complaint of the alleged incident to any member of the Committee in writing with his/her signature within 10 days of occurrence of incident. The Committee will maintain a register to endorse the complaint received by it and keep the contents confidential, if it is so desired, except to use the same for discreet investigation. The Committee will hold a meeting with the Complainant within five days of the receipt of the complaint, but no later than a week in any case. At the first meeting, the Committee members shall hear the Complainant and record her/his allegations. The Complainant can also submit any corroborative material with a documentary proof, oral or written material, etc., to substantiate his / her complaint. If the Complainant does not wish to depose personally due to embarrassment of narration of event, a lady officer for lady employees involved and a male officer for male employees, involved shall meet and record the statement. Thereafter, the person against whom complaint is made may be called for a deposition before the Committee and an opportunity will be given to him / her to give an explanation, where after, an “Enquiry” shall be conducted and concluded. In the event, the complaint does not fall under the purview of Sexual Harassment or the complaint does not mean an offence of Sexual Harassment, the same would be dropped after recording the reasons thereof. In case the complaint is found to be false, the Complainant shall, if deemed fit, be liable for appropriate disciplinary action by the Management. The Committee shall immediately proceed with the Enquiry and communicate the same to the Complainant and person against whom complaint is made. The Committee shall prepare and hand over the Statement of Allegation to the person against whom complaint is made and give him / her an opportunity to submit a written explanation if she / he so desires within 7 days of receipt of the same. The Complainant shall be provided with a copy of the written explanation submitted by the person against whom complaint is made. If the Complainant or the person against whom complaint is made desires any witness/es to be called, they shall communicate in writing to the Committee the names of witness/es whom they propose to call. If the Complainant desires to tender any documents by way of evidence before the Committee, she / he shall supply original copies of such documents. Similarly, if the person against whom complaint is made desires to tender any documents in evidence before the Committee he / she shall supply original copies of such documents. Both shall affix his / her signature on the respective documents to certify these to be original copies. The Committee shall call upon all witnesses mentioned by both the parties. The Committee shall provide every reasonable opportunity to the Complainant and to the person against whom complaint is made, for putting forward and defending their respective case. The Committee shall complete the “Enquiry” within reasonable period but not beyond three months and communicate its findings and its recommendations for action to the HR. The report of the committee shall be treated as an enquiry report on the basis of which an erring employee can be awarded appropriate punishment straightaway. The HR Head will direct appropriate action in accordance with the recommendation proposed by the Committee. The Committee shall be governed by such rules as may be framed by the Supreme Court orders or any other legislation enacted later on. The Committee may recommend to the HR Head action which may include transfer or any of the other appropriate disciplinary action. The management shall provide all necessary assistance for the purpose of ensuring full, effective and speedy implementation of this policy. Where sexual harassment occurs as a result of an act or omission by any third party or outsider, R J Bio-tech Limited shall take all steps necessary and reasonable to assist the affected person in terms of support and preventive action. The Committee shall analyse and put up report on all complaints of this nature at the end of the year for submission to HR Head. In case the Committee find the degree of offence coverable under the Indian Penal Code, then this fact shall be mentioned in its report and appropriate action shall be initiated by the Management, for making a Police Complaint.